100923 is rated 4.7 out of 5 by 3. Rated 5 out of 5 by Racing88 from I bought this hose for gas line and its great hose great price. Rated 5 out of 5 by Quickshift from Great Product I purchased the JEGS Pro-Flo 200 SS Braided hose to replace my stock fuel line on my 64 Falcon Drag Car. 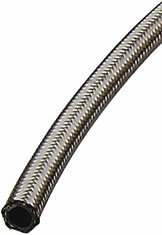 The hose and associated fittings made the replacement easy and very clean in appearance. Will the fuel hose support e85?